Bacteria is everywhere and while most microorganisms do not have much impact on our daily lives, some types can cause disease. Our pets are exposed to bacteria daily and most of the time their immune system is able to fight it off without showing any signs of sickness. Bacterial disease occurs when a cat’s immune system is weakened and the bacteria is able to replicate and spread in the cat’s body. The source of bacteria is usually contaminated water, dairy, feces or undercooked meat. Bacterial infections are common in cats that come from rescue situations where many cats are housed in the same area. Kittens and geriatric cats are much more at risk of becoming sick because their immune systems are not as strong as adult cats in their prime. Cats who are sick with a bacterial infection usually have digestive upset (diarrhea or vomiting), a fever and are lethargic or cranky since they do not feel well. It is important to keep a close eye on your cats’ behavior because cats are very good at hiding their illness. Even subtle changes in a cat’s behavior are worth checking out to make sure there is not an underlying problem. Cats can also occasionally be carriers of bacteria, meaning you can catch the germs from them, even if they are not showing symptoms of being sick themselves. Cleanliness practices when handling cat food (particularly raw meats) and cleaning the litterbox are key to keeping bacteria from spreading. 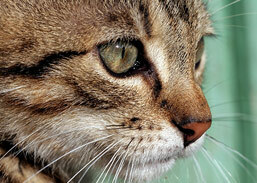 If you think your cat may have a bacterial infection you should call your veterinarian. Vets typically treat bacterial infections with antibiotic drugs and in severe cases additional support such as fluids for dehydrated pets may be needed. The feline oral microbiome: A provisional 16S rRNA gene based taxonomy with full-length reference sequences. Serotypes and virulence factors of Escherichia coli strains isolated from dogs and cats. Molecular analysis of human and canine staphylococcus aureus strains reveals distinct extended-host-spectrum genotypes independent of their methicillin resistance. Exposure of free-ranging wild carnivores, horses and domestic dogs to leptospira spp in the northern Pantanal, Brazil. Toxigenic corynebacterium ulcerans in a fatal human case and her feline contacts, France, March 2014. An experimental toxoplasma gondii dose response challenge model to study therapeutic or vaccine efficacy in cats. Bacterial and protozoal agents of feline vector-borne diseases in domestic and stray cats from southern Portugal. A case report of seronegative cat scratch disease, emphasizing the histopathologic point of view.